Knights have come to the fore again in creating and stitching time, as well as in the imagination. As they start to take shape they have brought up the excitement and anticipation of my first trip overseas and the desire to visit places that had fascinated since childhood. The tales of King Arthur, and his Castle of Camelot, of the magician Merlin, the beautiful Queen Guinevere and her lover, Arthur’s favourite knight sir Lancelot are still told even though many centuries have passed. Although the stories are largely hearsay, elaborated and coloured by different perspectives, time and imaginations, people want to, and many do believe, that there was a Castle Camelot in Cornwall at Tintagel where Arthur resided and where the knights of the Round Table gathered. Arthur, however, is unlikely to have lived in Tintagel, Legend rather has him conceived there through the trickery of Merlin. Much of the story we have was written by Geoffrey of Monmouth in the 12th Century and now beleved to be largely created from imagination, folklore and conjecture. 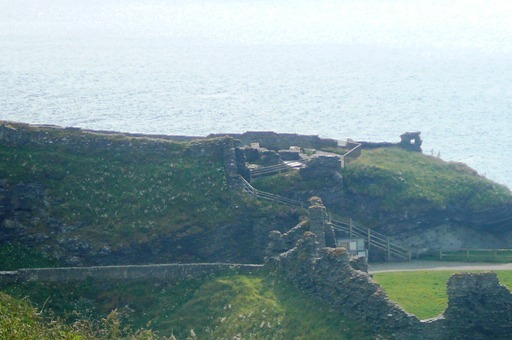 The ruins at Tintagel straddle a narrow, steep isthmus and were built for Richard, Duke of Cornwall, in the thirteenth century. 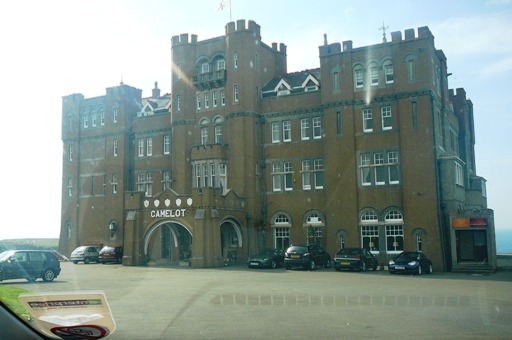 There is also another more recent Camelot Castle, a hotel, built in 1899 on the headland opposite. Tourism and the allure of the legend has lingered over the centuries, and it easy to imagine the Arthurian tales being marketed even in Monmouth’s lifetime. Just to see the site and the rugged beauty of the Cornish coast was overwhelming. 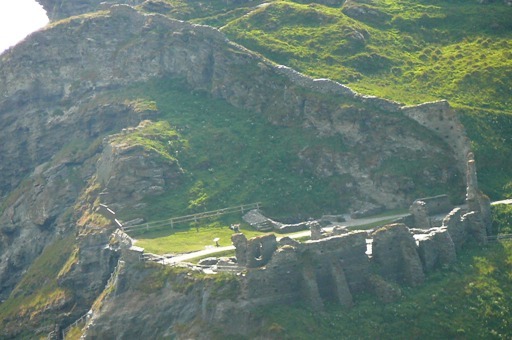 The location of Tintagel is a feast for all the senses and the imagination. 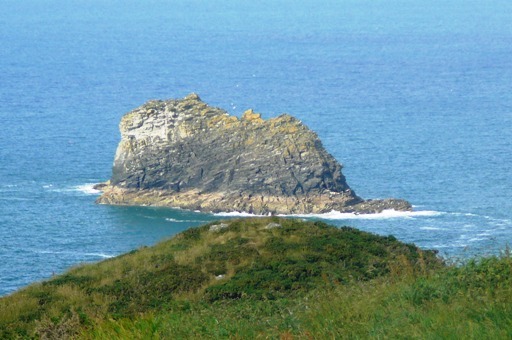 Underneath the cliffs, beneath the ruins, is a cave purported to be Merlin’s haunt. The turquoise sea glistens all around, beautiful and shimmering but like the secrets of the land, when it rages in stormy fury it must be quite terrifying. The erosion on the coast line is testimony to that. It is easy to picture Merlin in that dark cave, deep in the depths, ever present watching, waiting, wondering at the folly of men. Possibly there would have been smugglers and pirates regularly using the caves stealthily loading and unloading phantom ships. From ancient days there would have been traders from many different places bringing in their wares, preparing ships and tackle, replenishing stores and crews. That shore would have seen so much activity friendly and unfriendly. Perhaps there may still be secret visits from mermaids. I can just picture them sprawled on the beach, combing out their hair and softly singing the tides . Cornwall’s Tintagel is a place of great fascination and wonder; a feast for all the senses, one that grips and stimulates the imagination. I have always loved the legend of Merlin and Arthur!